When Ladakh was first thrown open to tourism an average itinerary encompassed visits to Leh and its environs with some treks into nearb valleys. The most popular of these were the 8-day Markha valley trek, the 11-day Lamayuru-Padum route and the Stok Khangri round trek. Now with growing interest in adventure tourism the focus has shifted to the mysterious valleys of Suru and Zanskar with their spectacular scenery. 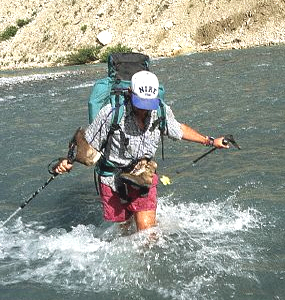 Sankoo, Panikhar, Rangdum and Padum in the Suru and Zanskar Valleys are the base for a variety of trekking routes. From Sankoo for instance, one can trek to Drass or to Mulbekh in the opposite direction. Treks originating from Panikhar in the Suru valley lead to different destinations in the Kashmir and Kishtwar valleys across the main ridge of the Great Himalayan range. 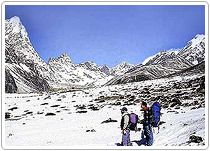 Rangdum offers more challenging treks. One more challenging treks. One route wanders across the Kanji-la through the Kanji gorge to Henaskut on the Kargil-Leh highway. The other crosses the glacial Chillung-la behind the Nun - Kun massif to get to the Kishtwar valley. From Padum four main trek routes go to different destinations - one to Manali in the Kullu Valley , one to Lamayuru and Hemis respectively and the last to Kishtwar. Areas of Ladakh that were once closed to foreign visitors have been opened now. Movement here is restricted to designated circuits and the maximum time allowed is 7 days. There are different categories of entry permits. Enquire about the specific permit applicable to one at Jammu and Kashmir tourist offices or Government of India tourist offices before planning a trip here. An expedition to this area takes the trekker to the picturesque villages of the Drok-pa people. Though Buddhist in religion, they are distinctly different, both racially and culturally. Possibly early Aryan settlers who came in from the Gilghit area, the Drok-pas have preserved ancient traditions that resemble Bon - Chos, a pre- Buddhist religion. Two of their villages Dah and Biama may be visited. 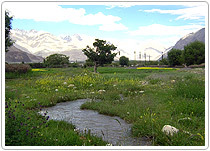 The route following the Indus after Khalatse goes past the attractive villages of Domkhar, Skurbuchan and Achinathang, set amidst fields of ripening crops and orchards of fruit trees. Along the eastern ridge of the Karakoram Range in northern Ladakh is the Nubra valley comprising of the upper Shayok and Nubra river valleys. The trekking route to this area is demanding and traverses the Kardung-la pass along the ancient trade route from Leh to Central Asia . It is the highest motorable road in the world! The breathtaking view from the pass surveys an entire length of the Indus valley in the south and a magnificent panorama of snow clad peaks. The route follows the valley past attractive villages to Deskit, the largest village in the valley. Onwards to Hundar down the Shayok valley, the trail wanders past rolling sand dunes. There is a small population of double humped Bactrian camels here and visitors can avail of a marvellous moonlight camel safari on the dunes. The beautiful high altitude Pangong Lake is also another popular destination with trekkers. It is a picturesque route that covers Shey and Thikse with their interesting monasteries, before turning off into the side valley of Chemrey . It goes over the Chang - la , the pass over the Ladakh range which despite it height is not too difficult to tackle. At the base of the pass, tangse has an ancient temple. The trek ends at spangmik, which is the furthest point to which foreigners are permitted - about 7 km along the southern bank of the lake. The Leh-Manali road goes through the upland desert plateau of Rupshu inhabited only by the nomadic chang-pa herdsmen and their flocks of Pashmina goats. Its bare rolling hills interspersed with dusty valleys are the setting for the spectacular Tso Moriri Lake and other lakes in the area. One trek wends its way to Korzok located just 5 km along the lake's 23 km length. This route takes off along the Leh-Manali road over the Taglang -la, proceeds to the twin lakes of Startsapuk Tso (a fresh water lake) and Tso-Kar (a salt water lake) and then on to Korzok.